Our teeth can discolor for various reasons. From dietary stains to in-born conditions, many factors can play a role in making our teeth not as perfect as we want it to be. Therefore it is important that normal variation in the color of teeth be distinguished from tooth discoloration due to disease origin (pathological). By definition, this is caused by extrinsic agents and can be removed by cleaning and polishing the teeth. Green, black, brown or occasionally red or orange deposits may be adsorbed onto tooth surfaces within the salivary pellicle or dental plaque, therefore making staining worse around gum margins and in less well cleaned areas . The stain may be derived from food, drinks, tobacco and other habits such as betel nut chewing, mouth rinses and other topical medicaments, or from occupational exposure to metallic salts. 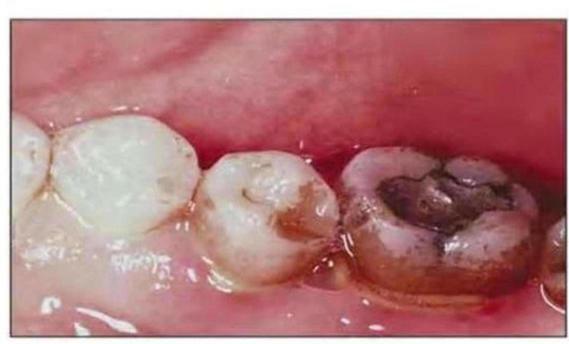 Green and black stains are sometimes seen in children on the outer surfaces of upper front teeth. It is thought that these are produced by chromogenic bacteria and such children usually have a low tooth decay experience. However whether or not this is related in some way to the cause of the staining or to other factors is unknown. Chlorhexidine mouthwash causes a brown stain by combining with dietary tannin. When the staining is associated with poor oral hygiene, demineralization and roughening of the underlying enamel may make removal difficult. Abnormally colored teeth are seen in amelogenesis and dentinogenesis imperfecta, other types of developmentally hypomineralized and hypoplastic enamel and white spot enamel decay. Turner tooth can occur when infection of the primary predecessor causes enamel hypoplasia (underdeveloped enamel) in a permanent tooth and the porous enamel absorbs extrinsic stains. A Turner tooth usually have an abnormal shape. Tooth decay is associated with softening of the tooth structure. Slowly progressing and dentine caries are the types most frequently stained. Fluorosis is a pathological condition resulting from an excessive intake of fluorine that affects all teeth. It varies from mild flecks of opaque white enamel to severely hypoplastic patches which take up extrinsic stain. The latter is seen is only seen in areas where fluorosis is endemic. The mildest effects are impossible to tell from the opaque flecks seen when water fluoride concentration is very low. Moderately affected cases of endemic fluorosis may have an apparent chronological pattern of fine white lines associated with periods of exposure to high doses. Tooth shape is usually normal unless condition is severe. 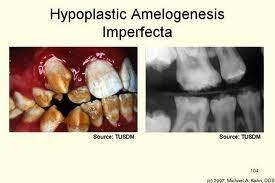 Amelogenesis imperfecta is an inherited condition which has numerous types and affects all teeth, though some forms are much milder in the primary dentition. Color change varies and is secondary to either hypoplasia (thin hard translucent enamel through which dentine is visible), hypocalcification (chalky white opaque soft enamel) and hypomaturation (patchy distribution of white opacities). Affected areas may also take up extrinsic stain and mild types are difficult to distinguish from fluorosis. 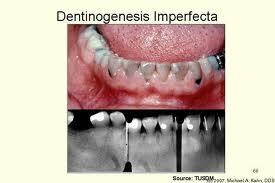 Dentinogenesis imperfecta is another inherited condition and, in some cases, osteogenesis imperfecta is associated. All teeth are even grey-brown color with altered translucency. Enamel usually fractures from the dentine and severe wear follow shortly after eruption. Regional odontodysplasia affects a group of adjacent primary and permanent teeth on one side of the midline of the face. Enamel hypoplasia leads to uptake of extrinsic stain and yellow cementum may be present over the crown. Affected teeth often fail to erupt. Chronological hypoplasia is a condition where horizontal band(s) of enamel hypoplasia are seen, each associated with a specific insult, usually a severe illness or metabolic upset including severe attacks of the common viral diseases of childhood. Affected bands are abnormal enamel which may be pitted, hypoplastic, rough, opaque or completely absent and also take up extrinsic stain. 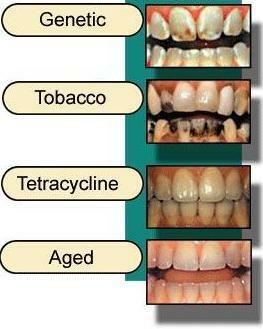 Age change can also cause discoloration in teeth. Teeth become yellower and slightly darker with age. This is an even color change and it is usually mild. 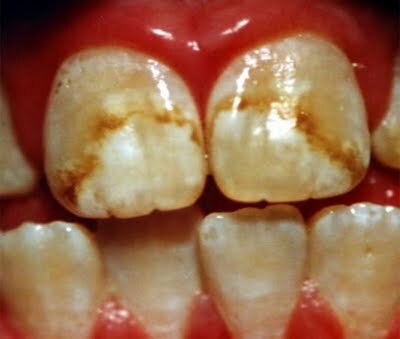 In addition to discoloration of teeth due to intrinsic change in structure, developmentally hypomineralized enamel and decayed enamel may take up stains from materials such as food and tobacco and acquire a dark brown color. Similar stains may diffuse into dentine exposed by decay or tooth wear, and some restorative and root filling materials and their corrosion products may also stain dentine. Pulp death is a common cause of a discolored tooth. Breakdown of dead tissue and of red blood cells from areas of bleeding leads to pigmented products which diffuse into the dentine. This entry was posted in Oral Care and tagged baby teeth discoloration, discoloration in teeth, discoloration of teeth, discoloration on teeth, discolored teeth, discolored tooth, teeth discoloration causes, tetracycline teeth discoloration, tooth discoloration on June 19, 2012 by oileng.